Today I’ll show you the most essential SQL functions that you will use for finding the maximums or the minimums (MAX, MIN) in a data set and to calculate aggregates (SUM, AVG, COUNT). 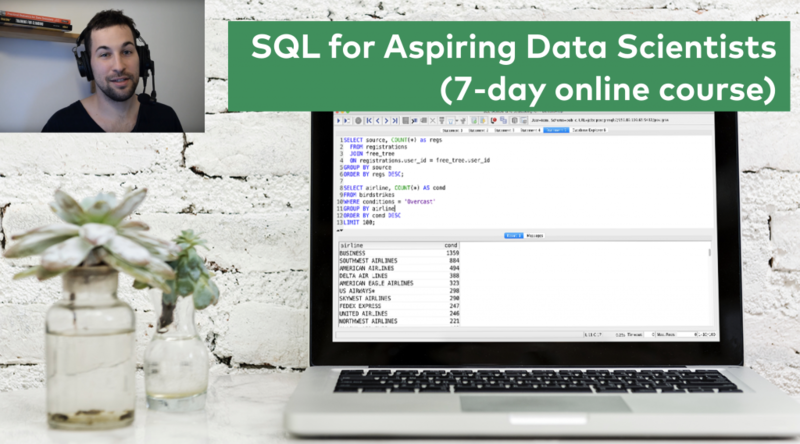 Then I’ll show you some intermediate SQL clauses (ORDER BY, GROUP BY, DISTINCT) that you have to know to efficiently use SQL for data analysis! And this is going to be super exciting, as we will still use our 7M+ line data set! Note: to get the most out of this article, you should not just read it, but actually do the coding part with me! So if you are on the phone, I suggest saving this article and continuing on a desktop! Make sure that you have the flight delays data set imported – and if you don’t, check out this video. Okay, let’s open SQL Workbench and connect to your data server! Can you recall our base query? And it returned the first 10 lines of this huge data set. All of these are going to be very easy, I promise… But make sure you are doing the coding part with me, because 100% understanding of this basic stuff will be important in the long term. Note 1: This is only true when you don’t have NULL values (empty cells) in your table (we don’t have NULL values in the flight_delays data set at all). I’ll get back to the importance of NULL later. Note 2: in fact you won’t need the LIMIT clause in this SQL query, as you will have only one line of data on your screen. But I figured that sometimes it might be better to keep it there, so even if you mistype anything, your SQL Workbench won’t freeze by accidentally trying to return 7M+ lines of data. The total airtime is a massive 748015545 minutes. Our next challenge is to find the mean of the arrival delays and the mean of the departure delays… The function for that is AVG (refers to “average”) – functioning with the exact same logic as SUM and COUNT. Okay! 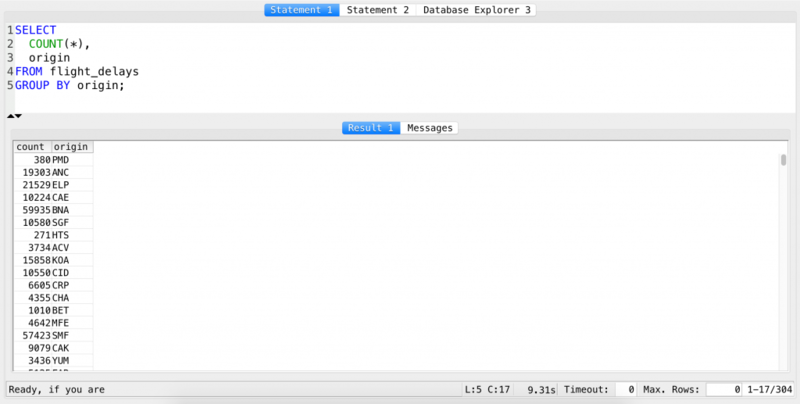 That was it – these are the basic SQL functions you have to know… It’s time to tweak them a little bit. As a Data Analyst or Scientist you will probably do segmentations all the time. For instance, it’s interesting to know the average departure delay of all flights (we have just learned that it’s 11.36). But when it comes to business decisions, this number is not actionable at all. However, if we turn this information into a more useful format – let’s say we break it down by airport – it will instantly become something we can act on! STEP 1 – Specify which columns you want to work with as an input. In our case we want to use the list of the airports (origin column) and the departure delays (depdelay column). STEP 2 – Specify which column(s) we want to create our segmentation from. For us it’s the origin. SQL automatically looks for every unique value in this column (in the above example – airport 1, airport 2 and airport 3), then creates groups from them and sorts each line from your data table into the right group. STEP 3 – Finally it calculates the averages using the SQL AVG function for each group and returns the results on your screen. But what just happened SQL-wise? We have selected two columns – origin and depdelay. origin has been used to create the segments (GROUP BY origin). 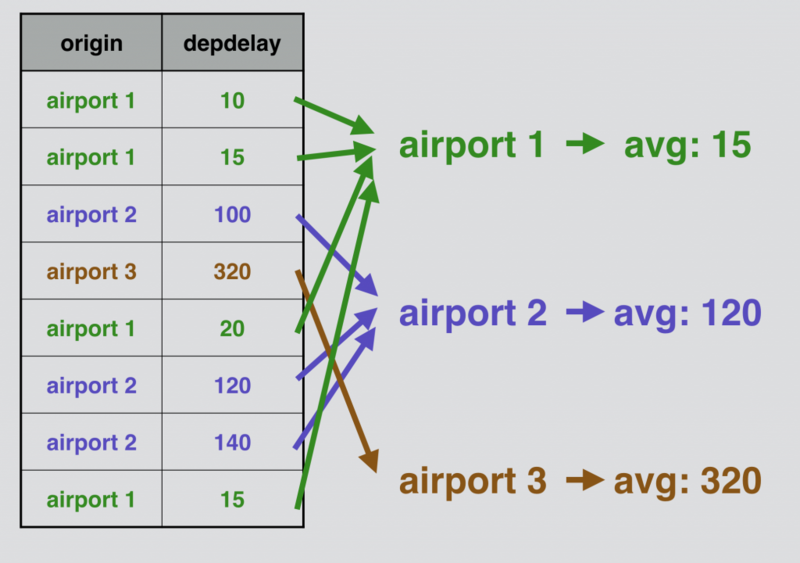 depdelay has been used to calculate the averages of the arrival delays in these segments (AVG(depdelay)). 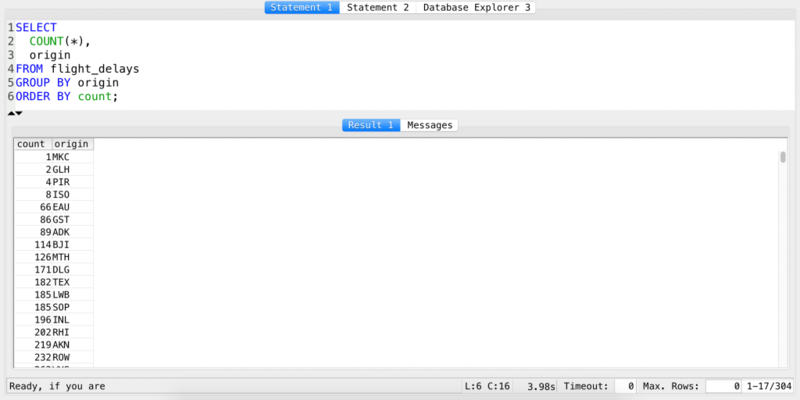 Note: As you can see, the logic of SQL is not as linear as it was in bash. 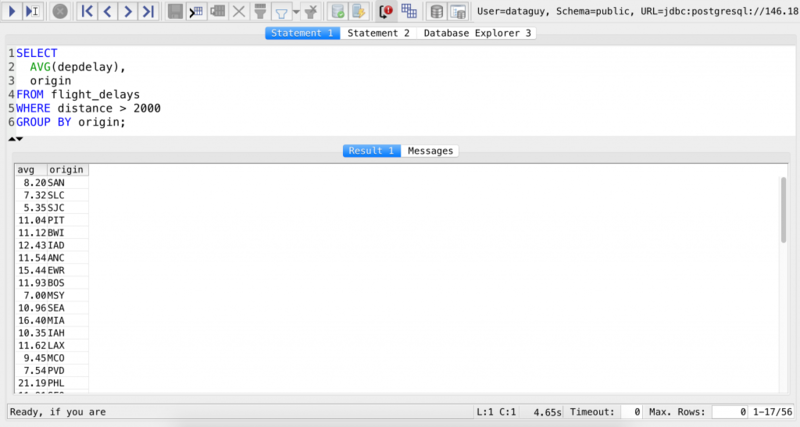 If you write an SQL query, the first line of it could highly rely on the last line. When you’ll write really long and complex queries, this might cause some unexpected errors and thus of course a little headache too… But that’s why I find it very, very important to give yourself enough time to practice the basic things and make sure that you fully understand the relationships between the different clauses, functions and other stuff in SQL. Print the total monthly airtime! I did pretty much the same stuff that I have done before, but now I’ve created the groups based on the months – and this time I had to use the SUM function. Calculate the average departure delay by airport again, but this time use only those flights that flew more than 2000 miles (you will find this info in the distance column). 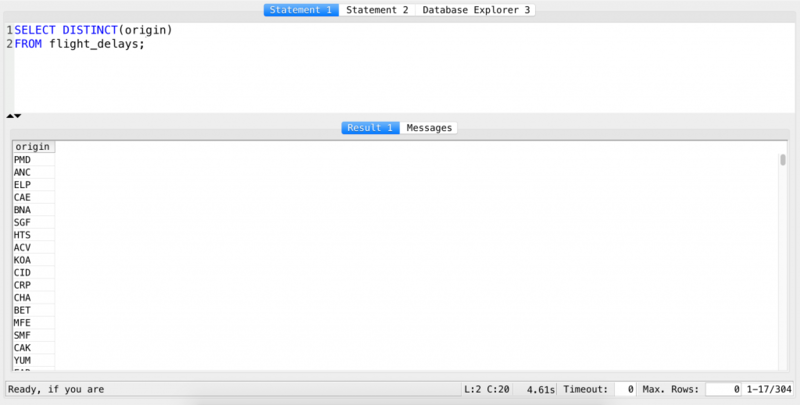 The takeaway from this assignment is something that you might have already realized: you can use the SQL WHERE clause to filter even those columns that are not part of your SELECT statement. But this list is not sorted by default… To have that too, you need to add only one more SQL clause: ORDER BY. When you use it, you always have to specify which column you want to order the results by… It’s pretty straightforward. Note: the column you will get after the COUNT function will be a new column… And it has to have a name – so SQL automatically names it “count” (check the latest screenshot above). When you refer to this column in your ORDER BY clause, you have to use this new name. I’ll get back to this in my next article in detail. If you find it weird, let’s try the same query but with ORDER BY origin – and you will understand it instantly. Hm, almost there. But the problem is that the least busy airport is on the top – in other words, we got a list in ascending order. That’s the default for ORDER BY (in our postgreSQL database at least). But you can change this to descending order by simply adding the DESC keyword after it! Now you have only unique airports! Though result-wise it’s pretty much the same, the preferred way to do this is to use the DISTINCT – when making more complex queries, it will help you to keep your query simpler! Today you have learned a ton of small but useful stuff. I’ll give you one more assignment that will summarize pretty much everything – even the previous two articles (ep 1 and ep 2). This is going to be a difficult one, but you can do it! If it doesn’t work at first, try to break it down into smaller tasks, then build and test your query till you get the result. (eg. if the plane with the tailnumber 'N387SW' landed 3 times in PHX and 2 times in SEA in 2007 on any Sunday, then it has a total of 5. And we need the top 5 planes with the higher total.) Ready? Set! Go! And that’s it! You have learned a lot again today – SQL functions (MIN, MAX, AVG, COUNT, SUM) and new important SQL clauses (DISTINCT, ORDER BY, GROUP BY). 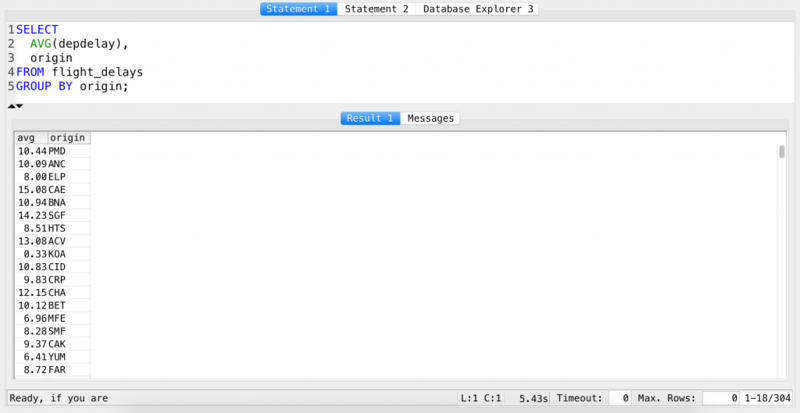 If you managed to get the last exercise done by yourself, I can tell you that you have a really good basic knowledge of SQL! Congrats! If not, don’t worry, just make sure that you re-read these first 3 chapters (ep 1, ep 2, ep 3), before you continue with episode 4! Can you explain how to copy the link to the dataset or paste it in the article above? The link cannot be copied from YouTube (or I maybe I just can’t see it below the video). But in this article is listed too: https://data36.com/sql-where-clause-tutorial-beginners-ep2/ –» in the “Import a bigger dataset into postgreSQL” section!